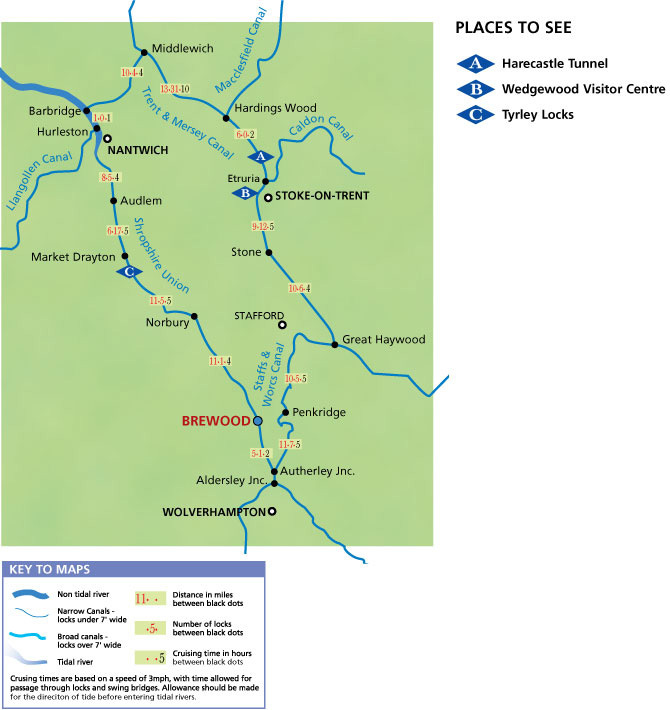 Very much a classic circular cruising route; this active and enthralling week long circuit passes through Staffordshire, the West Midlands (briefly), Cheshire and Shropshire. Head south from Brewood, and within two hours the left turn at Autherley Junction offers an inviting escape from the creeping urban tentacles of Wolverhampton. Here the Shropshire Union joins the much older Staffs & Worcester and the contrast quickly becomes apparent as the rural, meandering course of the latter follows the natural contours of the surrounding land. Slipping quietly past Stafford and across the Trent Valley, the Staffs & Worcester springs a final surprise as it suddenly broadens dramatically at Tixall Wide, an extensive lake bordered by lush reed beds which offer welcome sanctuary to Canada geese, grebes, ducks and moorhens. A notably elegant, roving bridge heralds the junction with the Trent & Mersey at Great Haywood, formerly a significant staging post on the cargo handling network and still a centre of boating activity. Completed in 1777, the Trent & Mersey has a gentle, winding ambience as it follows the Trent Valley northwards towards the Potteries. A fertile hunting ground for the industrial archaeologist, the Potteries offers a unique landscape of elegantly decaying wharves, warehouses and the occasional bottle kiln. Linger a while to visit the restored potter’s mill at the Etruria Industrial Museum and the renowned Wedgwood Visitors Centre before pressing on to sample one of the true spectacles of the canals, the damp and eerie passage through the 2,919 yard Harecastle Tunnel. The aptly named “Heartbreak Hill” dominates the 13 mile, 31 lock descent to the Cheshire salt town of Middlewich, from where the short and exposed Middlewich Branch follows the Weaver Valley south-westwards to join the main Shropshire Union at Barbridge. Audlem notwithstanding, your exertions are now largely behind you, leaving a day or two to savour the idyllic Shropshire countryside along the final, richly rural stretch to Brewood.